Здесь вы можете прочитать биографию Александра Твардовского на английском языке. 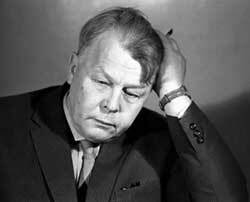 Aleksandr Tvardovsky (21.06.1910 - 18.12.1971) - Russian poet. Aleksandr Trifonovich Tvardovsky (21 June 1910 — 18 December 1971) was a Soviet poet, chief editor of Novy Mir literary magazine (1950-1954, 1958-1970). Tvardovsky fought hard to maintain the traditional independence Novy Mir had, even against official disapproval. During his editorship the magazine published Ilya Ehrenburg's Thaw in 1954, The Vologda Wedding by Aleksandr Yashin in 1962, and One Day in the Life of Ivan Denisovich by Alexander Solzhenitsyn in 1962. He received the Stalin Prize (USSR State Prize) (1941, 1946, 1947, 1971) and of Lenin Prize (1961, for the poem Expanse after Expanse (За далью - даль)). Tvardovsky was born in Zagorye, Russia. He joined the Communist Party in 1940 and was a war correspondent during World War II. By 1970, more hardline officials forced his resignation from Novy Mir, although he was awarded the Order of the Red Banner "for services in the development of Soviet poetry" that same year and the State Prize for Literature in the year of his death, 1971, in Moscow.